The artist has taken a photograph of a gravestone angel in a Chicago graveyard. Afterwards, it was edited, reduced and laminated for this pendant. 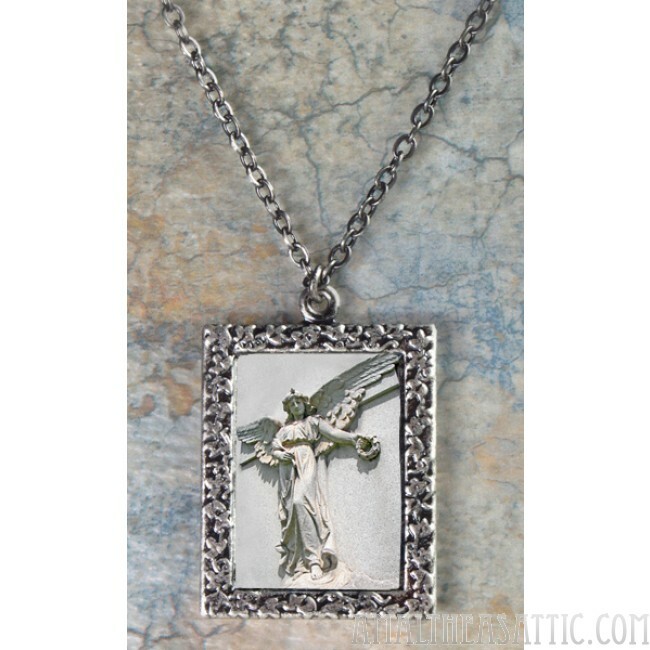 The necklace and frame is of the artist's design (with an ivy pattern on the edges) and was manufactured for her. You cannot get it anywhere else and they are not sold separately. It measures from the outside edges, 1¼" x 1 11/16" or 32mm x 40mm. 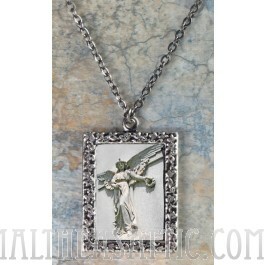 It comes in antiqued silver-plate and was designed it to be a larger format allowing the art to be better seen. It does open up, a new picture can be slid into the frame. The chain necklace measures 18"long.